The Trudeau government will have a tough balancing act ahead of them when it comes to relations with the Trump administration, according to political commentator and Toronto Star columnist Paul Wells. Delivering the keynote address entitled “A Trudeau Government in a Trump World” for the J.W. Dafoe Political Studies Students’ Conference on Jan. 25, Wells discussed the challenges ahead for the Trudeau government in maintaining a progressive social agenda while keeping Canada’s economic relationship with the U.S. strong. 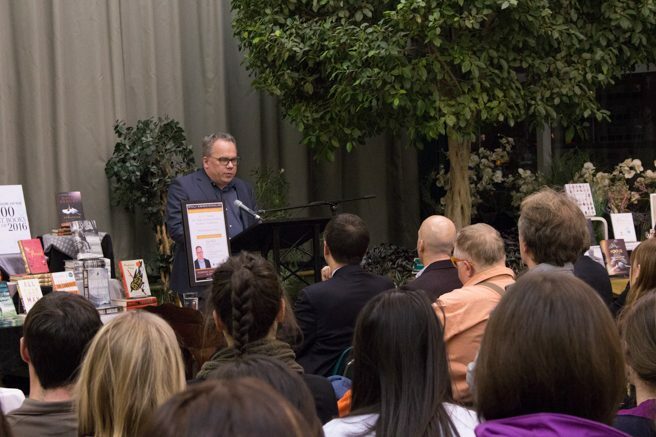 Wells outlined the efforts the Liberal government has already made to prepare Canada for a large shift in American domestic and foreign policy under the leadership of Donald Trump in his speech to a packed atrium at McNally Robinson Booksellers. Speaking with the Manitoban following his speech, Wells discussed Canada’s strong economic position in the event of any possible renegotiation of NAFTA or significant change to American economic policy. Wells went on to discuss the political cost Trudeau will have to pay at home in maintaining a working relationship with the new U.S. administration. On Jan. 26 – the day after Wells’ address – Trudeau’s ability to balance Canada’s economic interests and the prime minister’s social values were tested when he stopped in Winnipeg for his 10th cross-country town hall event at the University of Winnipeg. During the town hall, two fourth grade students worried about the businessman-turned-politician’s rise asked Trudeau if he would “save Canada” from the new president.